The playgrounds a generation of Singaporeans played and grew up in were slain in the name of safety. “Adults of tomorrow will recall dragons of Bedok” — declared a 1987 headline in The Straits Times newspaper. Three and a half decades later, this prediction seems prophetic given how fondly a generation of Singaporeans now remember the dragon-shaped playgrounds they grew up playing in. Like its inspiration, the dragon, this playground design has become the symbol of a myth, of a now almost non-existent space and way of play for a generation of Singaporeans. The dragon playground was first unveiled to the public in 1979, one of five ‘adventurelands’ that became a part of Singapore’s public housing esates. Other designs included a pair of doves, a metal cage, another with man-made slopes and one made for climbing. These new playgrounds, each costing around S$20,000 to construct, were the Housing & Development Board’s (HDB) plan to “move away from the preponderance of static animal sculptures” found in its existing playgrounds to “miniature adventurelands for the young and active” instead. Prior to the dragon design, playgrounds in Singapore were based on a model established some fifty years before, when the first was built here in 1928. In the small triangle junction of Selegie and Bras Brasah Road, children could be seen in this playground “climbing up the slide for one brief glorious slither to earth, rotating giddily on a new and remarkably effective type of roundabout, and using the swings, seesaws, and climbing ropes at the other end of the ground”. A group of businessman had pooled together a few thousand dollars to build this playground with locally produced equipment that was designed in the United States. They, like many during this time, saw playgrounds as important spaces for the city’s children. Not only did they keep children off the streets, they helped provide “lungs”, or open spaces, for those living in the crowded city. Designated spaces for children to play became a permanent fixture in Singapore’s cityscape when the Singapore Municipal Commissioners decided that one of its first tasks after World War II was to restore the city’s playgrounds. When Singapore accelerated the building of modern public high-rise estates to overcome its housing shortage in the 1960s, playgrounds proliferated. While children living in kampungs could play anywhere amongst nature, life in a city with its modern high-rise estates needed spaces that were safe enough for children to play. In 1969, Mr Khor Ean Ghee, fresh out of his interior design course in England, came to Singapore from Penang to join the HDB’s Design and Research section. Working under Mr Liu Thai Kher, who would later shape the development of Singapore as the chief of its housing and later urban planning authorities, Mr Khor was tasked to design the landscapes of housing estates and town parks. The playground was an element of landscapes and the 35-year-old then recalls that early ones had swings, slides, seesaws and merry-go-rounds housed in sandboxes or concrete flooring . The equipment was made in timber and metal that did not last. Timber not only attracted white ants, it splintered and rot under the tropical weather, and would “bite” users when spoilt. Mr Khor was tasked to come up with new designs, freeing up HDB’s architects to concentrate on the housing plans instead. With little experience and knowledge of how to, Mr Khor turned to his imagination instead. His earliest designs, revealed to the public in 1975, made play equipment like the swing safer by replacing the timber with rubber tyres. A series of animal sculptures made of concrete and terrazzo for children to play on were also introduced. Using locally created hume pipes as the starting element, he designed tortoises, rabbits, ducks, pelicans, elephants and giraffe. These animals came in varying heights to provide fun for different ages. A star of this series was the Dragon-shaped playground installed only in Toa Payoh Town Garden, then the largest single landscaped area in a HDB new town. The unique design had a metal dragon head supported by a circular monkey bar and a long spine for children to run on. This was the first version of the dragon playground. As the spine was thought to be too long and the dragon’s metal head was difficult to fabricate and maintain, Mr Khor set about improving his design. The new dragon head was made of concrete and terrazzo that incorporated slides; the spine was shortened and had swings and ropes attached to it. This design became a popular choice amongst HDB’s architects, many who picked it for the estates they designed, making the dragon the face of playgrounds in Singapore’s public housing estates. When the Government caught up with the backlog of demand for public housing by 1977, it began looking at how to create better housing estates, including giving each a sense of identity. This was reflected in a new set of elaborate playground designs imbued with identifiable forms, in particular local imagery. One example in the ‘80s was a playground built in Woodlands Town Garden that was based on a Malay folklore, “The Kanchil”. Other designs over the decade transformed the bumboat, kelong, kampung house, bullock cart, trishaw and traditional Malay kite into sites of play. While these designs earned praise from a visiting American playground expert, as an excellent expression of community identity, they were also thought to offer very little activities other than climbing, running and swinging. Many of the playgrounds were also underused because of their poor choice of locations, being far away from the housing estates. This issue was addressed in 1985 when it was announced that future playground designs would be smaller, but more of them will be built and spread inside housing estates instead. Playgrounds featured on the 1987 covers of Our Home magazine. The new directive was followed by a third generation of playgrounds, designed by a team without Mr Khor who had left HDB by then. Between 1986 and 1990, 23 new “creative playgrounds” were introduced, based on storylines and themes to encourage imagination, such as the “Old Woman’s Shoe House”, “Humpty Dumpty”, fire engines, petrol kiosks and colourful clocks. Local identity continued to be an important consideration as some of the designs included fruits like the pineapple, mangosteen and watermelons that were turned into swing and slides. Newer housing estates also had playground designs that reflected the history of the site. Choa Chu Kang New Town, once a rural farming area, had playgrounds based on fruits and vegetables, while the playgrounds built on the reclaimed Pasir Ris took inspiration from the sea. 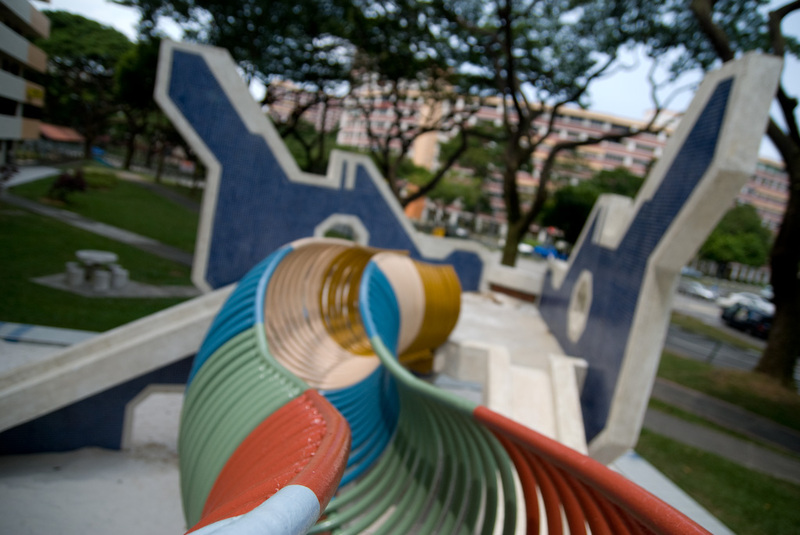 As Singapore entered the 1990s, playground designs even became influenced by global pop culture, taking inspiration from the then hit cartoon series “Teenage Mutant Ninja Turtle” and the movie “Jurassic Park”. The push to design even better playgrounds saw more and more abstract forms that aimed “to provide an environment for children to invent their own setting”. But just as it seemed that playground designs in Singapore were about to breakthrough to a new level of sophistication, everything unravelled. In 1993, while playing in a public playground in Ang Mo Kio, a five-year-old boy’s left thumb got severed when it was caught in a gap of a faulty slide. This incident happened just two months after The Straits Times had highlighted the lack of safety standards in playground designs after surveying eight of them. While the boy regained the full use of his thumb, the playground was swiftly demolished. A witch hunt ensued and a Canadian playground inspector was even brought to Singapore to audit the locally designed playgrounds. The verdict: they were “not safe by today’s standards”. In the following, months, playgrounds were quickly “upgraded” — equipment went from concrete and terrazzo to fibreglass modules; and sandboxes gave way to rubber mats. From then on, HDB no longer designed its own playgrounds, but bought them from international suppliers instead. As safety became a central concern for playgrounds, local safety standards for playgrounds were developed in 1999. A few years later, the rising cost of things also led the town councils run by the ruling People’s Action Party to advocate public housing facilities that were cheap to maintain. For playgrounds, flexible items like cargo nets and climbing ropes were removed as they spoilt easily. While there were rumblings from Singaporeans a decade after the 1993 incident if the safety exercise had gone too extreme, it was a little too late. The once ubiquitous locally designed playground had mostly given way to designs that were similar to those found around the world too. Recently, the heritage buzz generated by the government has been a surge in nostalgia again for these playgrounds. There have even been calls to preserve the remaining few old designs still standing. However, what is more interesting is the government’s latest plan to create “Destination Parks”. The first unveiled at Bishan-Ang Mo Kio Park has three new unique playground designs by foreign experts. This is similar to a series of gardens introduced in Toa Payoh, Ang Mo Kio, Clementi and Woodlands during the 70s and 80s that also had unique facilities including specially designed playgrounds such as the first-ever Spacenet playgrounds imported from the USA in Ang Mo Kio. It seems we have come a full circle. Could this renewed attitude towards playgrounds as more than just play spaces but also unique space markers filter down to public housing estates and lead to local designs again? But it might no longer matter as play to children today is increasing an indoor affair involving digital equipment, and when the dragons in the playgrounds have already been slain, what fun is there left in real life? A feature written for FIVEFOOTWAY magazine’s issue on PLAY. Tan Bah Bah, “Adults of Tomorrow Will Recall Dragons of Bedok,” The Straits Times, 27 August 1987. Christina Rodrigues, “Five ‘Adventureland’ Playgrounds Soon,” The Straits Times, 1 February 1979. “New Design Playgrounds,” Our Home, February 1979. “City Playgrounds for Singapore,” The Straits Times, 21 June 1928. “Let Them Play,” The Sunday Times, 8 June 1947. “New Play Companions,” Our Home, January/February 1975. “Toa Payoh Town Garden,” Our Home, July/August 1974. Justin Zhuang, Mosaic Memories: Remembering the Playgrounds Singapore Grew up In (In Plain Words, 2012). Jane Perkins, “Variations Will Be the Keynote,” The Straits Times, 20 December 1979. “Child’s Play,” The Straits Times, 27 June 1990. “$8.5 M Woodlands Playland,” The Straits Times, 17 July 1982. May Ho, “Our Playgrounds — so Safe,” The Straits Times, 4 November 1983. “Design Should Include an Element of Danger,” The Straits Times, 4 November 1983. “Recreation Facilities in HDB Estates under-Used,” The Straits Times, 9 March 1978. “More Parks, Playgrounds and Gardens, Says Teh,” The Straits Times, 27 February 1985. “Humpty Dumpty Comes to Pasir Ris,” Our Home, December 1988. Michelle Ho, “HDB Playground: From Sand to Rubber,” The Straits Times, 20 January 2003. “Boy, 5, to Regain Use of Thumb Sliced Off on Playground Slide,” The Straits Times, 20 February 1993. “Older Playgrounds Need Upgrading,” The Straits Times, 11 December 1992. “Upgrading of Playgrounds Cost About $50,000 Each,” The Straits Times, 7 June 1993. Theresa Tan, “Unsafe Playgrounds in HDB Estates Closed,” The Straits Times, 19 November 2003. Irene Josoeb, “The Thrill Is Gone,” The Straits Times, 23 November 2003. Joyce Teo, “Cheaper Upkeep for New Fittings,” The Straits times, 9 November 2004. Saifulbahri Ismail, “Three Set to Become Destination Parks,” TODAY 2012. “Spacenet Ropes ‘Em In,” The Straits Times, 2 October 1981.